My mom came over for dinner and Downton Abbey this week. She believes that On Demand is a magical thing that only occurs on my TV, so she has to come to my house (with 2 dogs in tow) to watch it. We had a great time hanging out and catching up on last week’s episode. When I have a great cook over for dinner, I automatically get nervous about what I’m going to make. And my mom is a great cook. To add insult to injury, I haven’t been to the grocery store in weeks! I did get a box of fresh veggies from my CSA last week so I decided to start there. I also had baked some chicken breasts earlier in the week, which I wanted to use up. 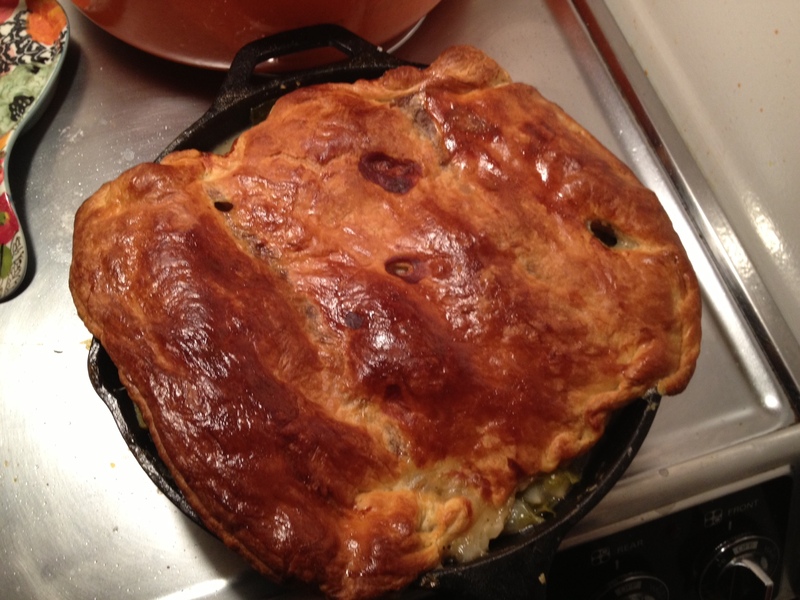 I decided to make a skillet pot pie. It was a first for me. I based my version off an Epicurious recipe, but had to be creative with some ingredients based on what I had. Plus, Epicurious’ version was a little too calorie-laden, so I lightened my version up with less oil and flour. Trust me, it did not sacrifice flavor. I have to say despite many experiments within the recipe, the dish turned out beautifully. It was easy to make, and did not take long at all. I would highly recommend it for last-minute guests or a low-key dinner with friends. Place a rack in upper third of oven, and preheat to 425°F. Heat oil in an 8″ cast-iron or other heavy ovenproof skillet over medium-high heat. Add onions, and cook, stirring occasionally, until beginning to brown, about 4 minutes. Reduce heat to medium-low. Add garlic and herb de Provence to skillet and cook, stirring occasionally, until garlic begins to brown, about 2 minutes. Add brussels sprouts and season with salt and pepper. Cook, tossing often, until it’s a little wilted. Sprinkle flour over. Cook, stirring constantly, for 2 minutes. Stir in broth, 1/2-cupful at a time, then add squash. Bring to a boil, reduce heat, and simmer until squash is just softened and broth is thickened, about 8-10 minutes. Add chicken to skillet, stir, and season with salt and pepper. Unfold pastry and smooth out the creases. Place the pastry over the skillet, allowing corners to hang over sides. Mix the egg and 1 teaspoon water in a small bowl, and brush pastry with the egg wash. Cut four 1″ slits in top to vent before placing it in the oven. The recipe said to bake pot pie for about 15-20 minutes until pastry is beginning to brown. Then, reduce oven temperature to 375°F and bake for another 15-20 minutes until pastry is deep golden brown and crisp. Each oven is different, so I’d urge you to watch your puff pastry in the first 10 minutes (or so) to make sure it doesn’t brown too quickly. I ended up turning the oven down after 10 minutes and moving the pan to the bottom of the oven to cook for the rest of the time. Let the pie cool for 10 minutes before serving with a salad on the side. Et viola! NOTE: This is sort of a “kitchen sink” type recipe, so you can experiment with a lot of different combinations of veggies. You can also speed up the cook time by chopping the vegetables and shredding the chicken in advance. Easy peasy. From the “guest”, this was absolutely delicious. Your guests will believe that you have slaved for hours to achieve such good taste.